The Reina Sofia Museum is located near Madrid’s Atocha train and metro station at the southern end of the city’s “Golden Triangle of Art”. Along with the Prado Museum and the Thyssen-Bornemisza Museum, the Reina Sofia Museum offers visitors one of the finest selections of art in Europe. As the national museum of 20th century art in Spain, the Reina Sofia Museum is sometimes called the Queen Sofia Museum or for short, “the Sofia” – all of which pays homage to whom the museum is named after – Queen Sofia of Spain. The Permanent Collection of the Museo Nacional Centro de Arte Reina Sofia officially opened on September 10th, 1992, no longer serving the public as just a location filled with temporary exhibitions. The Reina Sofia Museum would now be looked upon as a growing museum with an increasing collection of great works of art. The building which the museum now occupies dates back to the 16th century and was once part of a healthcare complex during the 18th century. Over the years many plans regarding the hospital were conceived and failed, but in 1977, the building received a Royal Decree, making it a symbol of great historical and artistic interest for the people of Spain. Restoration of the building took place in 1980, where Antonio Fernandez Alba led the way, followed by a few upgrades that included three glass and steel lift towers. Before the final building was revealed, the Centro de Arte Reina Sofia was established, hosting a few temporary events. In 1988, a Royal Decree established the centre as the new location for the National Museum, replacing the former Museo Espanol de Arte Contemporaneo (MEAC). The coming years of the museum would see the arrival of the famous Pablo Picasso creation, Guernica, which was met with some opposition, as it was Picasso’s wish that this work of art reside at no other location than the Prado. In the following years, the museum would soon prove its worth as an ideal location for a national museum. Besides exploring some of the impressive works created by remarkable 20th century artistic icons in Spain (Picasso, Dali and Miro), there are plenty of significant art collections to browse through at the Reina Sofia Museum. A visit to the museum brings you close to the beauty and technique of the likes of Antoni Tapies, Julio Gonzalez, Luis Gordillo, Jorge Oteiza, and Jose Luis Gutierrez Solana. In addition to the striking works of art, the museum is also home to a library, archive, bookstore, restaurant (Restaurant Arola Madrid), and gift shop. A collection of more than 100,000 books and about 1,000 periodicals are part of the library that focuses on 20th century art, and is regarded as one of the best in presenting 20th century art resources of its kind. A further exploration of the library will bring you to the intriguing array of videodisc selections, where visitors gain access to more than 9,000 slides of photography. For those who prefer sound, the museum presents the opportunity to listen to some of the more than 3,500 cassettes and CDs that the museum library has to offer. A remarkable assortment of documentary videos regarding contemporary art and artists are also housed on the premises. At the end of a visit, the perfect souvenir awaits your attention at the gift shop, where a collection of design items, writing materials, postcards, jewellery, and pottery help capture the memory of a trip to the Reina Sofia Museum. Picasso’s Guernica is by far the most important exhibit in the Reina Sofia Museum which you’ll find in Room 6 on the 2nd Floor. When the Reina Sofia Museum became the new home of the Guernica it was a great accomplishment for the newly established museum. 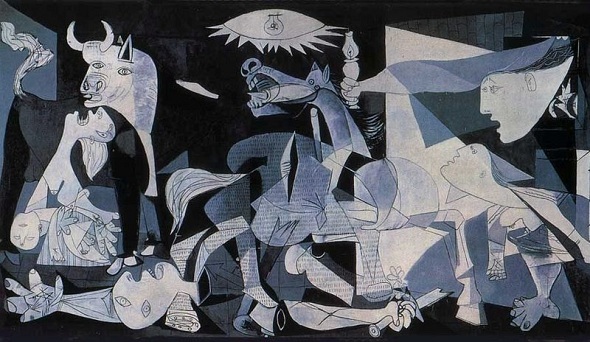 Picasso had created the work of art in 1937 during the Spanish Civil War having been commissioned by the Spanish Republican Government as anti war propaganda. He named it after the Basque town of Guernica which was bombarded by Nazi air strikes which caused the death of hundreds of civilians. Picasso created a striking black and white oil painting filled with the emotion of the violence, death, suffering, vulnerability, and cruelty associated with the events that took place. The painting displays an explosion of chaos that includes various people, animals, and buildings. The allure of the piece also includes the twisted messages and hidden images within the painting, including a skull that forms the upper teeth and nose of a horse. A great deal of symbolism regarding war and Spanish culture has also made the Guernica a remarkable example of Spanish art. The positioning of the Permanent Collection is a significant part of the museum, as two separate floors accommodate a distinct separation in art. The 2nd floor offers a wealth of historical works created until 1939, while the 4th floor centres on contemporary artists. A trip to the early 20th century- focused 2nd floor opens the eyes to Dali’s Cubist Self Portrait (1923), which highlights oil and cardboard collage on wood. The Woman in Blue (1901) is also on the 2nd floor where Picasso created heaven with oil on canvas at the tender age of 20. Additional works of art include the imaginative oil creation of Toros (Tauromaquia) (1933) by Benjamín Palencia, the welded copper sheets that make up Etude de Prophète (1926) by Pablo Gargallo, and the seductive shades of blue in Belomancie (1926) by Ives Tanguy. Joan Miró is also well represented with some of his finest works including Man with a Pipe (1925), Portrait (1938) and Femme Et Oiseau Dans La Nuit (1903). Outstanding pieces by Juan Gris are also on display including his celebrated Guitar in Front of the Sea (1925). Moving onto the 4th floor, the space is decorated with contemporary works of art created after 1939 until the present. It is here that the creativity of Francis Bacon and Antonio Lopez Garcia comes alive. The 4th floor is also home to the golden assemblage of wood called Sequeros (1961) by Lucio Munoz, the fiery oil on canvas, Composición (1966) by Jose Guerrero García, and the 1970 work of art called Sin título (Scalea) by Pablo Pier Calzolari, which displays steel, copper, and neon. Overall, the Reina Sofia Museum has successfully become an established national museum with an impressive collection of 20th century art that spans the controversial and triumphant acquisition of Guernica to the latest and greatest in contemporary Spanish art. Private Walking Tour of the Prado and Reina Sofia Museums: This private walking tour of two of Madrid’s great galleries includes the services of an official English speaking guide who will show you around some of the main works in each gallery. (Tour Ref: 1206).